Isn’t it great to play hooky from work every now and then! 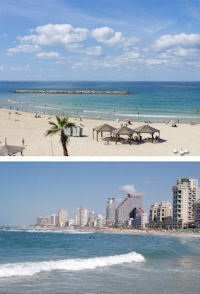 In Israel, all along the Mediterranean coast, there’s no better place to do that than at the beach--the warm sand, the cool waves, playing matkot, eating artikim . . . even surfing! During Lesson 19, Liat tells us such a colorful story about her day at the beach yesterday, it’s almost as if we were there with her. rak shniya--just a second! This story happened yesterday. Doesn’t that mean we need a different verb tense? bediyuk--exactly! Until now, we have been studying Hebrew verbs in the present tense. Learn Hebrew Pod shiur mispar tsha-esre gives us our first look at the past tense. And, of course, we’ll learn the Hebrew words for such wonderful things as taking a day of from work, swimming in the sea, resting on the sand . . . The perfect lesson to listen to while relaxing on the beach! Come to think of it, it’s gotten a little quiet around here. Hey . . . Eran? Liat? Jonathan? Where did everybody go? le-chof ha-yam, kamuvan! !